Unlike in the previous decades, a lot of people with HIV are now living their lives normally and not as outcasts. Albeit there are still improvements that can be implemented about AIDS awareness among the populace, there is a positive change on how those afflicted with the virus are viewed and treated. We even have a World AIDS Day, celebrated every 1st of December each year, to promote informative discussions about the disease and encourage fair treatment of people with HIV. Other than awareness, one area where we can help with the treatment of HIV / AIDS patients is on their physical rehabilitation. HIV or Human Immunodeficiency Virus is a type of lentivirus* that attacks the victim’s immune system, which is the body’s resistance to infections and diseases. HIV will eventually lead to AIDS or Acquired Immune Deficiency Syndrome. 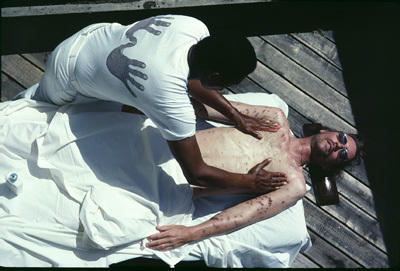 People with AIDS have a weakened (and continuously deteriorating) body resistance, thus making them more susceptible to infections that opens them up to other illnesses. HIV is contracted via sexual contact, blood transfusion, and unsanitary re-use of syringes. One aspect of AIDS treatment that is often overlooked is how AIDS patients, due to the infections and even the side-effects of certain drugs, experience lessened and (sometimes) painful movements. Some patients also experience a sensation of “pins and needles” on their legs making them unable to stand or walk. Not a few of them have been confined to wheelchairs because of such condition. This could be a pace beyond osteoporosis, in which patients would endure bone infarction particularly of the hips and knees. Patients with HIV need not be debilitated nor endure immobility. Physiotherapists can provide treatment and assistance when it comes to maintaining balance on body motions and the management of pain. The role of physiotherapists is primarily the physical rehabilitation of patients; included in it are the prevention and management of disorders in relation to physical mobility (or immobility, for that matter). Daily mundane (yet important) activities such as getting up and down the stairs, bending to reach an object, and driving a vehicle may already be daunting to some patients dealing with the chronic effects of HIV or AIDS. With physio care, however, they can be dealt with through a workaround – allowing them to still experience a sense of independence. Physiotherapists are the best medical carers who can advance, educate, and provide treatment and management of the physical rehabilitation for those living with the syndrome, with the aim of maintaining and improving their mobility and physical condition. Through guided exercises, prescribed workouts, manual manipulations, and therapeutic utilities, physiotherapists can reduce the disabling effects and chronic symptoms of the health problems being brought about by HIV / AIDS. People who have HIV can still dream and live out their dreams. Albeit the cure for AIDS has not been discovered (yet), our era has provided us the science and medical technology to manage and slow down the progression of HIV on those who are afflicted by it. We have doctors, nurses, and rehabilitative specialists – such as physiotherapists who are ever ready to provide treatment and care. * Lentivirus is a variety of viruses belonging to the Retroviridae family, which incubate inside their hosts for long periods.